Before You Even Know You Have It, Glaucoma Can Destroy Your Sight! A regular eye exam can save your sight! Glaucoma, which is actually a group of diseases, is a leading cause of irreversible blindness worldwide. Glaucoma occurs most often when the normal fluid pressure inside the eyes (intraocular pressure or IOP) rises, damaging the neurons that form the optic nerve. With early treatment, you can often protect your eyes against serious vision loss. Treatment currently consists of lowering eye pressure through medications, laser, or surgery. Studies have shown that early detection and treatment of glaucoma, before it causes major vision loss, is the best way to control the disease. So, if you are in a high-risk group for the disease, have your eyes examined thoroughly every two years by an eye care professional. What are some signs of Glaucoma? Acute Angle-closure Glaucoma: This is an urgent situation and can cause blindness if not treated immediately. It results from a rapid or sudden increase in the pressure inside the eye. See an ophthalmologist immediately if you experience these symptoms. Glaucoma has no cure. 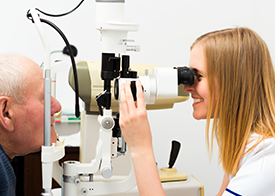 Vision lost from glaucoma cannot be restored, which is why early diagnosis is so important. If you are being treated for glaucoma, be sure to take your glaucoma medicine every day. See your eye care professional regularly. Dr. Burk is fellowship trained in glaucoma management and treats her patients with eye drops and the Selective Laser Trabeculoplasty (available in her office). 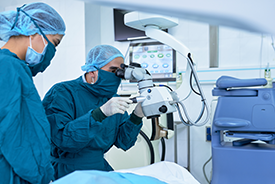 Occasionally, a trabeculectomy and/or glaucoma tube shunt may be required in advanced cases.